2014 Best Reggae Artist winner, Sono Vero performs with Through the Roots at DiPiazza on Saturday, Nov 15 in Long Beach. 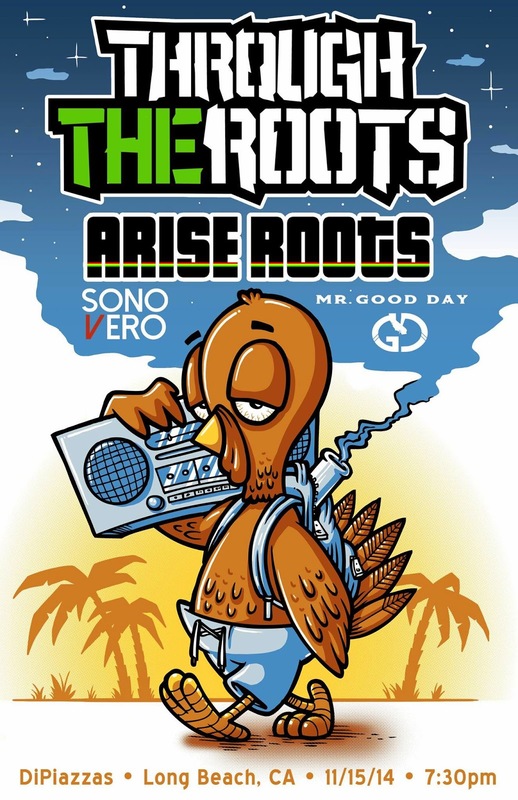 Sono Vero and Through the Roots will share the stage with veteran artists Arise Roots and Mr. Good Day. Nov. 3, 2014 - LONG BEACH, Calif. -- Sono Vero is the reigning 2014 Artists In Music Awards winner for Best Reggae Artist and currently holds several nominations including Best Reggae Artist and Best Alternative Artist at AIMA Season IV. Sono Vero take the stage at DiPiazza's in Long Beach at 7:30pm. Sono Vero is a talented young band from Southern California and the 2014 Artists In Music Awards Best Reggae Artist winner. Sono Vero brings a fresh fun sound that blends Island Reggae with a Hip-Hop/Rap flair. From the beach to the city, Sono Vero is a product of their California surroundings. This Alternative/Reggae/Hip-Hop group has performed across the country and has shared the stage with some of the most reputable names in the scene. The successful release of their self titled EP climbed to the top 10 itunes reggae albums charts. "Our music is real. I am inspired by life. Whether the song is about falling in love, a one night stand, or getting drunk at the beach it's all coming from real life experiences," says lead singer Charlie Ueda. Sono Vero recently finished recording their new "Roses for the Reckless EP" with legendary producer Lewis Richards released Valentine’s Day 2014 and is currently No. 7 on iTunes Reggae charts.